Neuromuscular Massage Therapy (NMT) uses static pressure on trigger points to increase oxygen and promote the release of trigger points. Trigger points are muscle fibers that do not have proper oxygenation due to postural deviation, injury, allergies and nutritional deficiencies or even emotional imbalance. 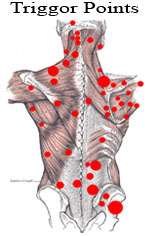 Trigger Points will refer pain to other parts of the body and often are the culprit in most common pain patterns. Upon arrival for a NMT session it is important to communicate all of the areas where pain is being experienced. Keep in mind that often where pain is felt and where the pain originates may be different places. After each trigger point is addressed pain is assessed again. Often in neuromuscular massage a series of points will be addressed to help with restricted range of motion and chronic pain associated with injuries. NMT is all about getting to the “root” of pain in a manual fashion. The best way to work with your neuromuscular therapist is to remember to take long deep breaths and communicate if pain becomes too deep. Deeper doesn’t always mean more effective and the same techniques can be applied for longer with less pressure to get similar results. Because of the direct nature of neuromuscular massage there are only a few contraindications for NMT. If you question your ability to receive massage based on a specific diagnosis please feel free to call us.